Can you tell we love Trader Joe’s? My fancy breakfast bowl contains the perfect amount of nutrients to start the day off in full glory. 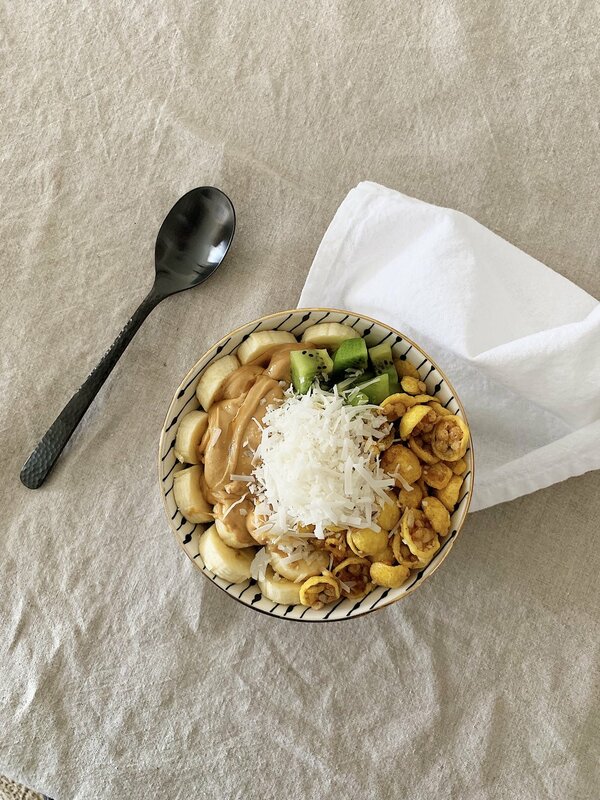 Whether it’s your slow Tuesday morning or a packed house on a Saturday morning , this oatmeal bowl is sure to become a favorite. You can serve this meal for guests because it’s pleasing to the eye and tasteful to the taste buds. It will also keep everyone full for a long period of time. I start off by boiling my “go-to” coconut and almond milk blend by Califia. As the milk is heating up, I add two scoops of the grass-fed collagen powder. I also add a dash of salt and the pure bourben vanilla extract. Once the liquid ingredients start boiling, I put in the oatmeal and chia seeds to give them time to expand during cooking. This particular oatmeal requires to be cooked for 10-20 minutes. I personally cook for 10 and allow it to cool off for 5. The first step for a beautiful creation is something that I learned from my husband. He always likes to include a pleasant surprise at the bottom of the bowl. In this case, I added frozen blueberries. Before decorating, I put all of the cooked ingredients into a bowl with blueberries on the bottom layer. Now its time to get carried away with the toppings! My favorite way to decorate the oatmeal bowl has to be a combination of fruit and berries. Grab your most loved granola mix, one scoop or butter, and one scoop of honey. Design it in a way to make it look and taste Instagram worthy. Maybe finish off with a handful of coconut flakes?! Toppings are optional. I can’t stop you there!